theslowdiyer | DIY electronics and audio projects – at a snail's pace! Well, not completely wooden of course! Some years ago I showed a plan to make a set of amps with wooden front panels, because I picked up some pre-cut wood in the right dimension on one of my trips to Japan. A while back the plan was resurrected, but then immediately brought to a halt because I had to enlarge some already-drilled holes and managed to destroy one of the panels in the process – bummer! The set consists of a DCB-1 preamp (on a clone board), meaning a DC-coupled version of the classic B1 buffer circuit, and a Hifimediy T4 Tripath-style class D power amp. The power supply is a surplus N2 XL375-type which I bought a small stash of some years ago. 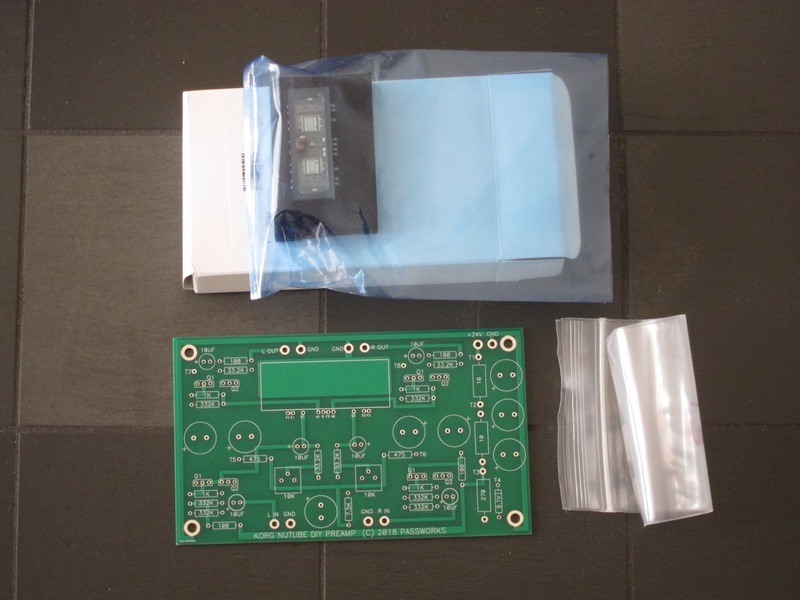 With the current trend in audiophile parts being that all the “old” audio grade parts that we know and love are either being discontinued outright or at least replaced with something in impossibly small surface mount packages, it’s almost inevitable that we all at some point face a choice between giving up on a project and sourcing parts from “questionable” channels such as eBay or Aliexpress. Here are the questions I personally ask myself before buying something and while they are definitely not a guarantee against wasting your money, they might help someone decide when to take a (calculated) risk and when to pass up what otherwise looks like a good opportunity. This project was of course driven by the fact that I really liked my original F5 build, but also by the fact that I had some suitable heatsinks and that I got a good offer on a couple of transformers that were really meant for a Pass/FirstWatt mono block build (2x18V/250VA each). The heatsinks actually turned out to be a mixed blessing, because they are just a millimeter or two too tall for most of the readily available enclosures, so I had to go up to a 3U size. I also decided to choose a slightly larger footprint instead of trying to shoehorn everything into a “real” half-width box. That annoyed me in the beginning, but to be honest I am not regretting that now. When I started to look around for balanced preamp designs some time ago, the BBA3FE wasn’t the only design that turned up. Another candidate was a sort of “predecessor” for it, namely the Pass Balanced Zen Line Stage (aka BoSoZ). I was a little slower getting started on this one so the BBA3FE came first, but a few weeks later inspiration struck and I managed to finish the layouts for both the BoSoZ and the matching PSU as well. I chose a mono configuration for the amp board to maximize flexibility and minimize board cost. I’ve only made some minor changes to the schematic, but you should be able to see the resemblance to the BBA3FE layout easily. My prototype version uses 27.5mm output caps because I had some I wanted to use, but the “real” version of the board has space for 37.5mm caps as well and is only slightly larger (app. 5mm deeper). As you can see I’ve actually also made good headway on the mechanicals of the design so what you can see now is really a semi-completed amplifier. Other than the new amp/psu boards I’ve picked components “off-the-shelf”, i.e. input selectors, an output relay board and an aux PSU that I have previously done, so putting it all together wasn’t that hard to do. Yes, it’s this season’s last (or the year’s first) Christmas present which finally turned up 🙂 It’s a partial kit version of the “B1 Korg” preamp circuit, which is to say B1 that Nelson Pass modified to use a Korg “Nutube”. The Nutube is basically a solid-state version of a triode tube, meaning it doesn’t require high voltage, doesn’t use (and waste) a lot of power and and doesn’t have a relatively short lifespan. What it retains is the tube “character”, meaning a relatively high and almost completely 2nd harmonic distortion level. I have actually been looking at the Nutube during my trips to Japan, but it seemed a bit expensive on its own and there were no designs available that seemed to scream “build me” as a looked at them. However, now there really was no excuse for not trying it and as regular readers will know I have been a big fan of the original B1 design and its derivatives. Sometimes my projects are “stationary” for a very long time, and then a small nudge from another project is just what was needed to get them going again. 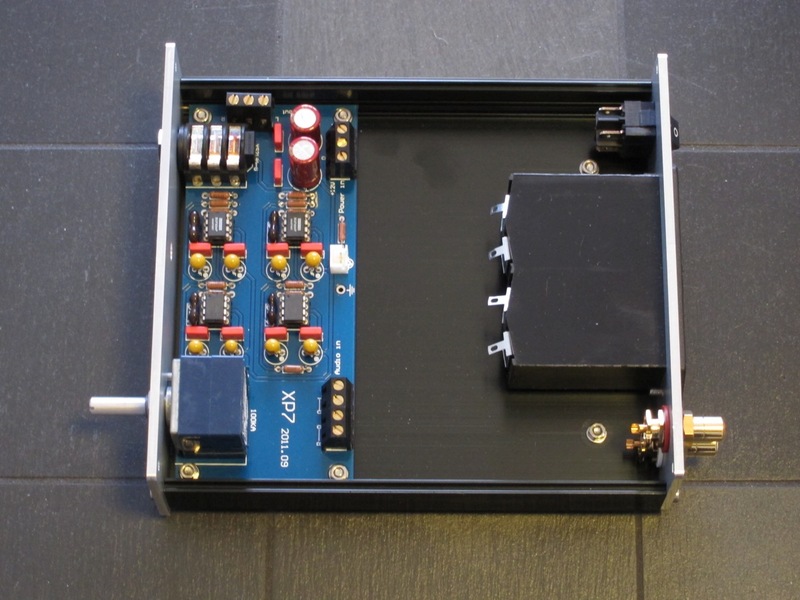 The XP-7 is a pretty straightforward headamp design with an opamp and a BUF634 output buffer in the feedback loop, as was the “state of the art” around 15 years ago 😀 . The only things that stand out in the clone design are the feedback resistor values that are lower than usual (which means lower noise) and then the chosen opamp which is an AD797 that also has very low noise. Together they should make a very dynamic amplifier and I remember being pleasantly surprised when I tested the bare board. However, putting it in a case should make is easier to try again (although to be honest I do next to no headphone listening these days). I’ve made a little bit of progress on my balanced mono block 700ASC-amplifiers lately, so now is probably a good time to release the project files for the balanced buffer input board and the accompanying PSU that I used in that design. It’s a pretty obvious clone of AMBs Alpha24, but since I did my own board and ditched some of the configurability I figured it’d be OK. Big thanks to Ti Kan though for actually showing how to build this circuit which I previously attempted a couple of times without getting it right. …ESP8266’s that is (if you hadn’t guessed that 🙂 ). Although I am not directly involved with it, I have several colleagues at work that are looking at Industrial IoT applications for various use-cases. Quite a few of them have built personal home-automation systems of one sort or another, and as I would actually like to do a ittle bit of monitoring/control around my house as well I started looking at options a while back. My old Ampduino project was of course a big inspiration, but the Arduino lacks onboard wifi which is a big drawback, even for “IoT” at home, and so the ESP8266 was a very logical step up. The original plan was to build from scratch using “raw” ESP-12 modules, but after a bit more research I stumbled upon the Wemos D1 mini. I then decided to go back to the original “Ampduino” approach of building a baseboard for a ready-made module instead. This gives a good amount of flexibility while at the same time ensuring that USB, programming and all other standard functions work as they should. For once, I decided that I was going to get started on the software-part of this immediately (that’s usually my weak spot) and since I have had to wait three weeks for the fist PCBs to arrive I’ve made very good progress. Two things helped me along though: Firstly that I found a basic sketch at RNT that did a rudimentary version of exactly what I wanted, namely control via a web-UI. Secondly, I had a standard NodeMCU-board which I could pop in a protoboard immediately. That made it feasible to start getting individual pieces of the code together as soon as the PCB-order was submitted and then subsequently assembling the pieces of code into the “real” thing later on. My prototyping efforts while the v1.0 boards were in the mail also gave me input to v1.1 boards, so I can actually start placing those orders in a couple of weeks (no point doing it now because all the PCB factories are closed for Chinese New Year). As usual for this type of project I’ve ended up making several versions of the board. The “original” version is USB- or DC-powered and has an onboard relay and an onboard DHT22 temperature/humidity sensor in addition to a couple of spare in/outs (analog/digital). The smaller version shown here ditches the onboard relay and instead breaks out a full set of SPI-pins. This allows connecting an SD-card adapter so that data from either the onboard DHT22 sensor or any of the other inputs is saved to a local card as well as being displayed on a web interface and a local LCD/OLED display (via I2C). The original plan was to do a mains-powered version but I couldn’t get a good design together at the time and so I went DC-powered instead. However, I think I’ve cracked it now so the next run is going to include a mains-powered version as well. Other changes for v1.1 will be some routing improvements and (most likely) doing away with the onboard DHT22-sensor and replacing it with the option of one or more offboard sensors based on the BME280 and/or the DS18B20 sensors. Dashboard example for the web control. Most of the indications work, but some of the information is still static data (like the time). This small design is actually a solution to a problem I have, but as it’s also one I’ve seen others describe from time to time I still find it worth sharing. My current preamp is discrete and has a 15-second delay before the output is turned on (to allow it to stabilise). This means that the poweramps I use will turn on before the preamp and consequently I get a bit of a turn-on thump in the speakers when the preamp turns on. There is a 12V trigger output on the preamp, but even if there was a trigger input on the poweramps as well (and there isn’t) the 12V trigger is active immediately and so that doesn’t really help. The easiest way to fix it – introduce a longer delay before turning on the power amps – only required a modification of my previous delay circuit to power a bigger relay, so that’s what I did. The relay I’ve chosen is an Omron G5LE which is rated app. 5A with a reactive load, so that should be fine for most amps in the power range that I normally use. Not all manufacturers publish the specs of their 12V triggers, but those that do generally state a max. current capability of 100-150mA. As a single 12V board draws app. 45mA with the relay engaged powering one board should be fine and even adding a second should be trouble-free as well. When I made the board I only really could see the point of a 12V version, but afterwards I realized that a 5V version would be able to work with USB-power and that might be worthwhile as well. On 5V the current consumption should be just under 100mA, which pretty much any (non-portable) USB source should be able to provide.